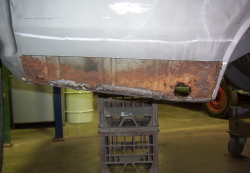 Rust in the drivers side rear quater. 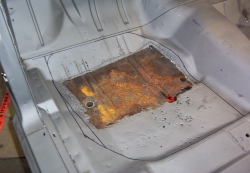 The outer panel removed, new inner panels were made up and welded in then new outer panels formed fitted and welded in. 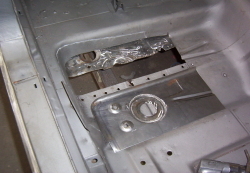 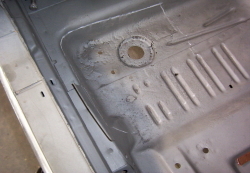 The rear of the drivers side floorpan had may pin holes and was thin in places. 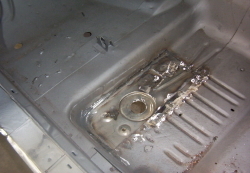 The area was cut out and a new section made up,this was the last trial fit before welding it in. 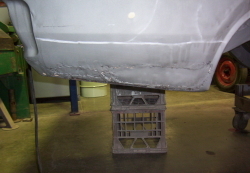 Section welded in and ground back. 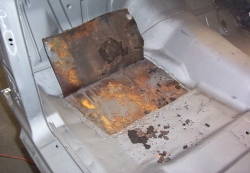 Passengers side floor pan had a patch welded in over the old panel as a repair ,and the rust just kept on rusting both panels. 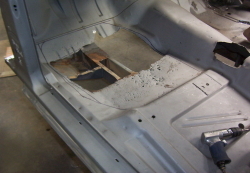 Due to the large number of pinholes a large section was required The original floor was cut out to make fabricating a replacement easier.